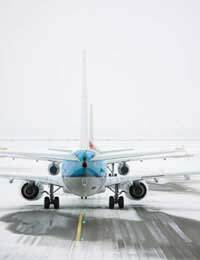 It’s a big worry for travellers due to fly anywhere in winter – what happens if the flight is cancelled due to the weather, or you miss your connection, or even worse, getting stuck in an unexpected travel delay means you miss your flight anyway? While there’s really nothing we can do about the fact that the UK is blessed with a travel system that appears to be woefully inadequate when it comes to dealing with inclement weather, there are rules that put you in a slightly less perilous position if your flights are affected by snow, ice or other atrocious weather. Recently, flights from Heathrow were affected by the airport running out of plane de-icer, and it’s not unusual for planes to be grounded for hours after scheduled take off while they are de-iced. This can be irritating but also impacts on forward flights if flying long haul. Legally, you should be able to expect your flight to depart on time, and as detailed on your tickets. We all know that with the best will in the world, even in normal weather conditions, this isn’t always the case. In winter, the situation gets even worse as people spend inordinate amounts of time looking at flight departure screens waiting for the magic words ‘boarding now’ to appear. The most important factor in whether you’re entitled to any form of compensation for a delayed or cancelled flight is whether the airline are to blame for the delays; if they can pin the blame on what’s called 'extraordinary circumstances', they may be exempt from having to make any compensation payments. If your flight is cancelled you can either ask for a refund or insist on being flown to your destination as soon as possible.If the flight is just late in departing, you might also be entitled to some compensation, depending on the length of the delay, and where you’re headed. Back in November 2009 the European courts ruled that in certain cases passengers are entitled to compensation, but the ruling is being appealed. If you’re badly affected by a long flight delay, there’s no reason why you shouldn’t put a claim in now pending the outcome of the appeal.Depending on how far you’re flying, and how long the flight is delayed for, EU rules already stipulate that airlines should provide free meals, drinks and two phone calls, free emails, and/or compensation – in some cases up to €600. How Do You Get Compensation from the Airline? If your flight is seriously delayed or has been cancelled, get straight onto the airline responsible and tell them you intend to claim. Once the claim is made, if the flight operator doesn't sort the problem out to your satisfaction, you have the option of escalating it to the Air Transport Users Council. Can the Airlines Get Out of Paying? Unfortunately, yes. The definition of ‘within the airline's control’ is confusing so many airlines will try to wriggle out of paying you any compensation if they deem the cancellation as due to ‘extraordinary circumstances'. Extreme weather conditions are counted as being ‘extraordinary’ – so it depends on whether an unusual and unexpected amount of snow was deposited in the Gatwick vicinity...or perhaps they are attempting to wriggle out of compensation due to a bit of ice on the runway in December, which clearly wouldn’t be extreme or unexpected! What if You Get Stuck in Traffic? It’s your worst nightmare – you set out in good time but there’s a hold up on the M25 due to the weather and you miss the flight. It’s clearly not the airline’s fault (and you can bet that it will be the one time the flight leaves on time) but it’s not really yours either. If you’re flying in winter it pays to make contingency plans for this type of event, as the airline don’t have to help you, and in all fairness probably won’t. This is where having a decent travel insurance policy will help. Check your policy before you go, and make sure that you’re covered for missing a flight due to weather conditions. Most policies will stipulate that if you miss your flight because of public transport letting you down (due to snowfall causing cancellations, accidents or delays) or the car you’re travelling to the airport in is involved in an accident or a breakdown, you can claim back the cost of any overnight accommodation or travel costs incurred in getting you to where you’re headed. Many policies exclude private cars from the travel delay payout, even if caught up in delays due to a snow-related accident. It might be a good idea to book a taxi to the airport if the weather is bad....just because you’re then covered by the public transport clause of the policy and if you miss your flight you can claim.